The early morning air was crisp with a calming scent, and as the sun settled over the basalt plateaus to the east, the residents of the Jewish village of Kantur took the time to enjoy the soothingly warm rays, which briefly overcame the bone-chilling winter winds being swept off the lake deep in the tranquil valley to the west. A new load of flax had just been purchased from the Christian village of Bethesda on the northeast side of the lake’s shore, and the increasing demand for soft, pure-linen fabric ensured that the Jews of Kantur would be working steadily throughout the winter months, processing the raw flax into a dyed-white material that could then be turned into a handsome profit. More importantly, this lucrative textile would be used by the community itself as clothing for the High Holy Days and for wrapping the bodies of those whose lives would cease to exist over the coming year. While the villagers of Kantur strode optimistically to their dyeing basins on the south side of the village, the thought of death could only have been connected to those who would eventually be buried in the pristinely engineered garments. Suddenly, the earth started to sadistically tremble beneath their feet with such wrath that even the fiercest believers began to question their faith in the almighty Elohim. Volcanic boulders hurtled down upon them from the elevated plateau, leaving them with no time to comprehend the fact that their own journey to the next world was only seconds away. Instead, the newly purchased flax would soon be used to cover their own lifeless bodies. On the morning of January 18th in the year 749 CE at approximately 10am, a monstrous earthquake caused by a rapid shift in the Arabian tectonic plate ravaged the area between the Arava region in Israel’s south and the Hula Valley in the north. At the time, these areas were referred to as Jund Filastin and Jund al Urdunn—the military districts of Palestine and Jordan—under the control of the Umayyad Caliphate, the first Muslim dynasty to reign over the Levant, beginning in 661 CE. The quake was massive. According to ancient chronographers, tremors were felt all the way from Damascus to Cairo. One Coptic priest in Alexandria noted that the support beams in a number of Alexandrian houses shifted abruptly, while a Syrian priest recalled that a village in the area of Mount Tabor—what is today Israel’s Lower Galilee region—had moved a distance of four miles. These reports may be more myth than memory, but it is clear that the disaster was enough to wipe out a number of urban population centers in the holy land as well as groups of isolated communities at the epicenter of the quake. It also proved to be a turning point in the history of the region, terminating the Umayyad dynasty and opening the doors to the House of Abbas—the Abbasid Caliphate—who would put its stamp on the Near East for the next 500 years. Over the following centuries, a number of Muslim historians focused their attention on the destruction of al-Quds—Jerusalem—and the large-scale renovations of the al-Aqsa Mosque. 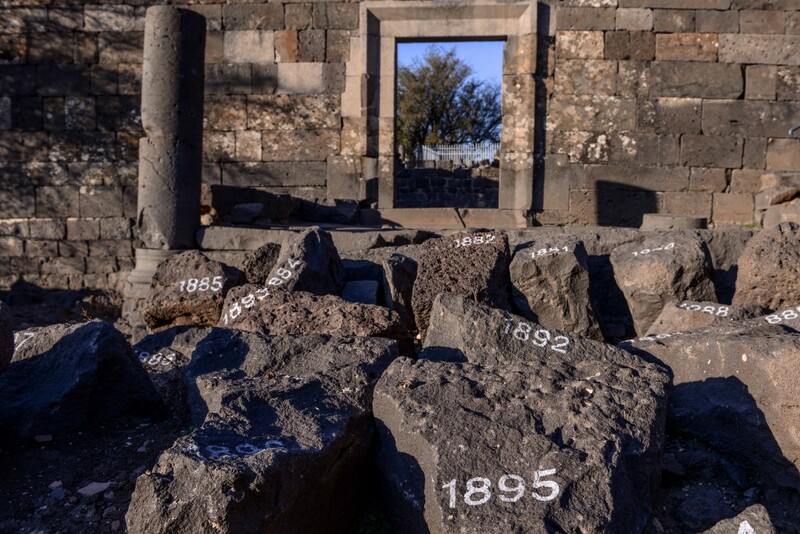 However, the archeological ruins in the area of the upper Jordan Rift Valley, Lower Galilee and Golan Heights offer a unique glimpse into the disaster, and into how teams of historians, archeologists, and tech-savvy geologists are working to illustrate the magnitude of the destruction. 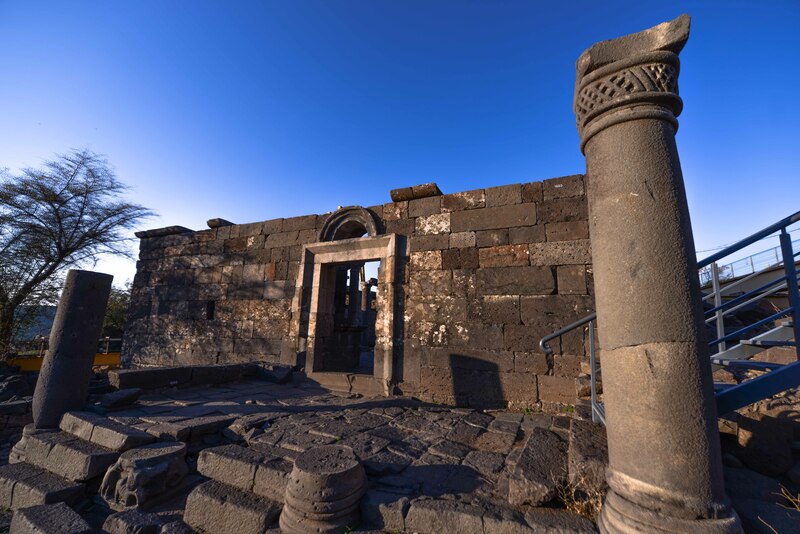 Along the way, they have enhanced their focus on one of the most extraordinary archeological sites in the history of the Jewish people, which should provide a more nuanced understanding of ancient Jewish life in the Bashan – a geographical area which includes the Golan Heights and stretching deep into eastern Syria. 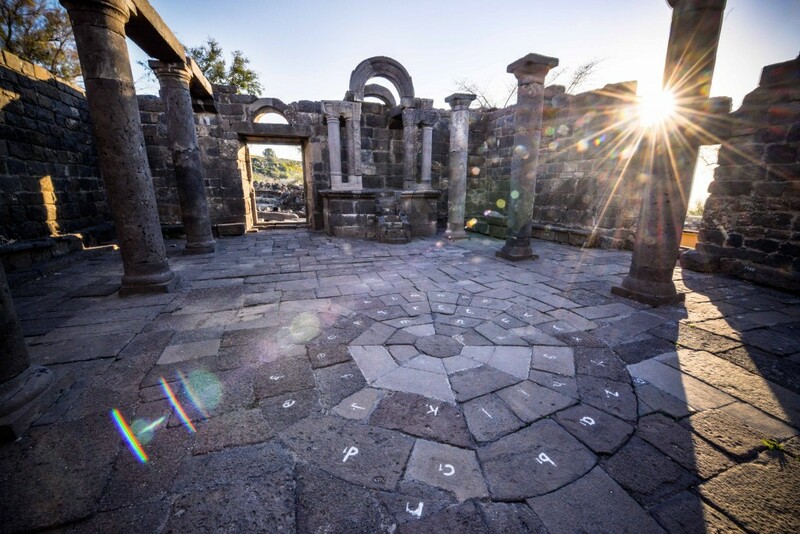 Nestled above the Samach stream, down the road from Kibbutz Natur in the southern Golan Heights, is the site of Umm el Kanatir—“Mother of Arches” in Arabic. The site gets its name from the Roman-period arches built over the local spring, where pagans once worshiped cultic statues. Umm el Kanatir has been identified as the ancient Jewish village of Kantur, mentioned by the 16th century Jewish sage, Menachem de Luzano; and possibly Kamtaria, which is mentioned in the Talmud and whose Jewish roots go back to the Byzantine era (324-638) and the establishment of Christianity as the official religion of the Roman Empire. Although the site appears relatively small compared to the cities destroyed by the great earthquake of 749—it encompasses just 7.5 acres—Umm el Kanatir is a researcher’s paradise due to its wealth of aboveground archeological evidence, visible to the naked eye and dating primarily to a single period. It is almost as if someone pulled a tablecloth out from under a full dinner spread with the wine glasses falling like dominos. This is not the only thing that makes the site so unique. The much larger city of Beit Shean, for example, collapsed in similar fashion and offers a larger variety of archeological remains. In Umm el Kanatir, however, unlike almost anywhere else, it is possible to reconstruct nearly 100 percent of the village’s central structure, using the original, basalt-hewn stone blocks to do so. Even more meaningful, especially in the context of Jewish history in the Golan during the Byzantine and Talmudic periods, is that this structure has been positively identified as a synagogue; and not just any synagogue, but an intricately decorated masterpiece that testifies to the sheer wealth of the community that built it. For the first time ever, using a unique restorative technology, the world will be able to see a fully reconstructed Talmudic-era synagogue in its original form using the original building materials, just as it appeared nearly 1300 years ago on the tragic day of January 18, 749. 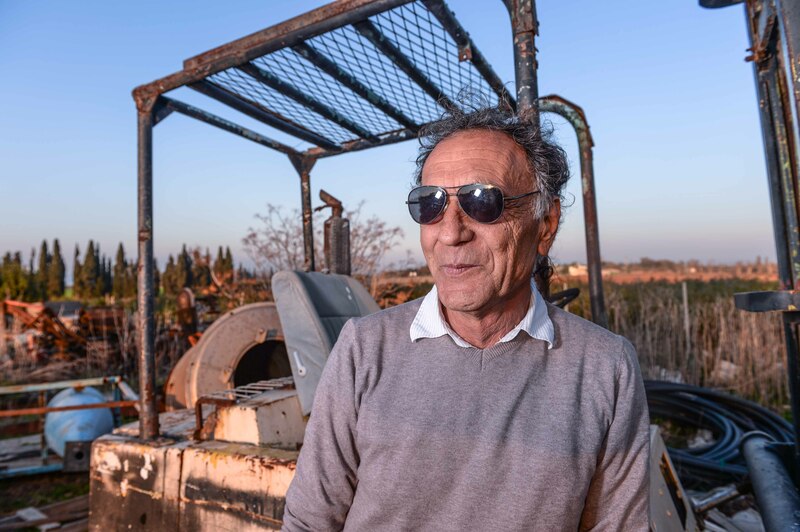 One man has dedicated a large portion of his life to telling the story of Kantur and rebuilding the structure that captured the village’s everlasting memory of Solomon’s Temple and the intense yearning for a return to Jerusalem. 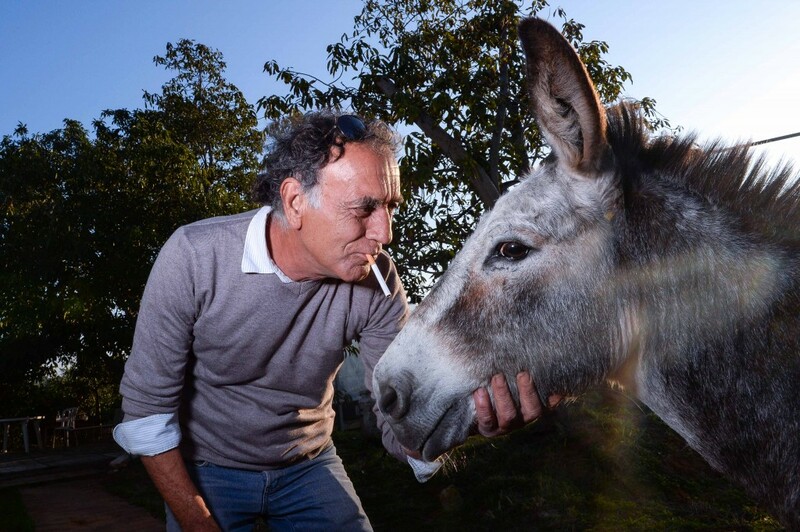 Yeshua (Yeshu) Dray sits under a makeshift canopy, chewing pensively on a Noblesse—Israel’s notoriously harsh, domestic cigarette brand—and waiting for Itzhak, a lifetime friend, to finish preparing coffee on an outdoor stove. It’s a breezy day in Pardes Hanna, an Israeli town straddling the southern slopes of the Carmel Mountain Range and the Irun Pass—one of the few inland corridors connecting the Mediterranean coast to the Jezreel Valley. Internationally, Yeshu Dray is considered one of the foremost experts in his field, and is often invited abroad to lecture about his recent discoveries. While other archeologists love to get into the theoretical and imaginative side of their discoveries, Dray focuses on the tachles, Yiddish slang for “actually” or ”practically.” “I work on what I find,” he says. What I see is what there is. Then the archeologists come in and start to throw around different arguments and theories. Today, archeology has become so subjective that anyone can sit down in some university and decide to be an archeologist. Then their heads will be full of ideas from archeologists who have worked their entire lives to prove what they want to prove. It’s simply a joke. 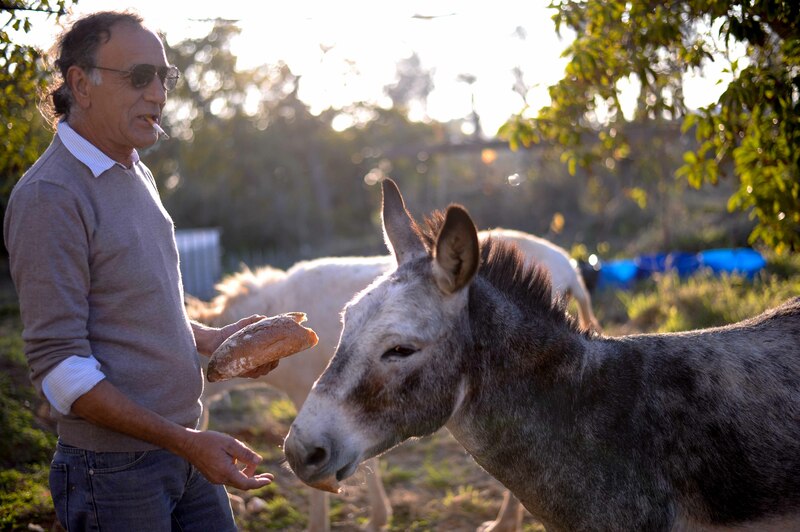 Dray’s research into Umm el Kanatir began nearly 20 years ago, when Dr. Haim Ben-David, head of the Israel Land Studies program at the Jordan Valley Academic College, invited Dray to join him at Dir Aziz, another Talmudic-era village in the Golan a few kilometers northwest of Umm el Kanatir. 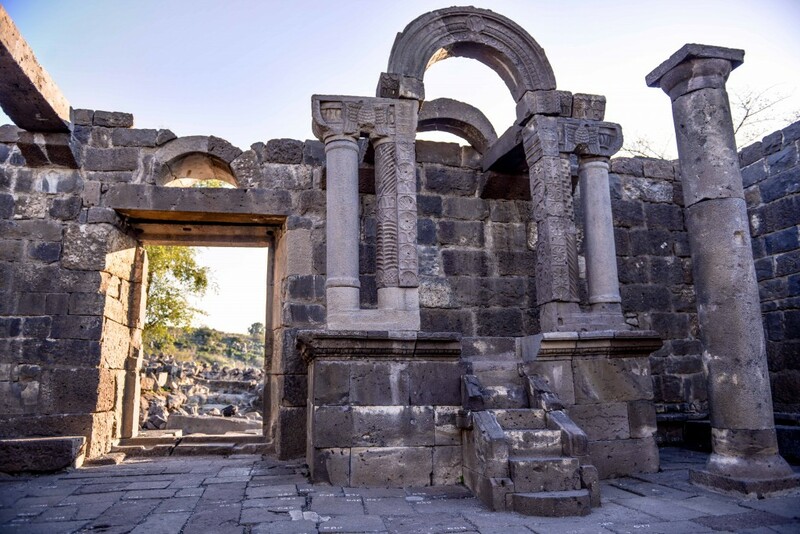 After Dray expressed enthusiasm at the prospect of rebuilding parts of the ancient synagogue at Dir Aziz, Ben-David said that he had something even more interesting to show him—the site of Umm el Kanatir. Immediately, Israel’s leading “unofficial” archeologist realized that the earthquake had leveled the site’s largest structure like a line of dominoes, with each block falling in sync with the others. Even more extraordinary was the fact that, aside from a few Syrian shepherds and herders who would use the stones to construct temporary dwellings, the blocks had essentially remained untouched since 749. Usually, remains from previous periods are used as spolia—secondary building materials—by future generations. But the barren and mostly infertile landscape around the Samach Canyon ensured minimal generational settlement, save for a brief 300 years between the 5th and 8th centuries CE. Dray and Ben-David were by no means the first archeologists at Umm el Kanatir. It was initially surveyed and recorded in 1884 by the British Judeophile and evangelical Protestant Laurence Oliphant and the German Templer architect-turned-archeologist Gottlieb Schumacher. Oliphant and Schumacher were mapping the area in order to find the most logical route for one of the Ottoman Empire’s new railway projects, which was to run from Haifa to Damascus via the Jordan River. Oliphant later said of Umm el Kanatir that the local spring water was “pure as crystal” and the site provided its inhabitants with a “charming refuge” from the innate difficulties of living on the border areas of the Bashan. Oliphant also noted the site’s most important artifact. After exploring the site, he wrote in his diary that the largest structure on the site had a carving of an eagle on its arched entrance. 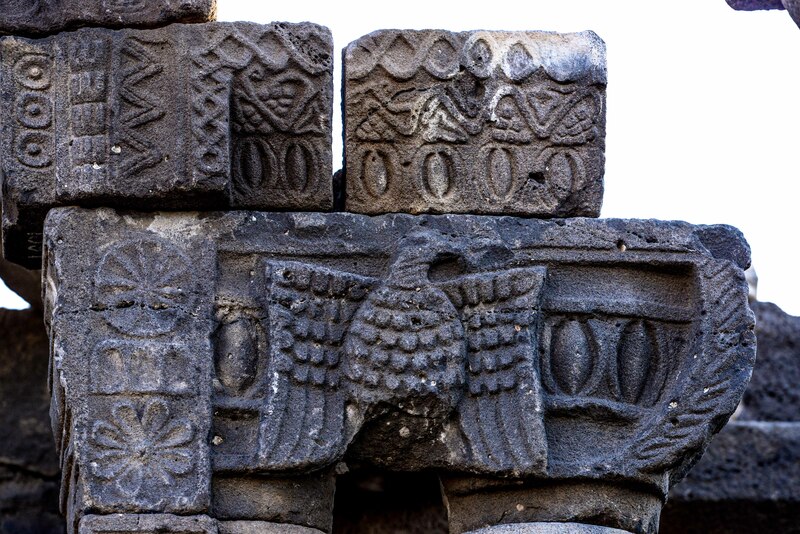 In ancient times, the eagle was one of the symbols commonly associated with the land of Judea. Oliphant concluded that the structure was a synagogue and the site an ancient Jewish village. Oliphant’s conclusions were correct but, according to Dray, he had no concrete evidence to support his claim. Archeologists have a tendency to make baseless proclamations about identifying large structures in ancient Jewish villages as synagogues. They often… immediately assume that the largest structure is a synagogue just because that has become the common understanding in the field. But this is completely baseless. If you look all across the Horan [Bashan], you will find a large communal building in each village whether it is a Jewish, Christian, Muslim, or pagan town. In most cases, you could identify these structures as pagan temples or town halls just as easily as… a synagogue. In order to be certain, we must wait until we have identified enough elements to prove that these buildings served as synagogues. And unfortunately, there are many cases in which this has not been done, and people jump the gun too quickly in attaching Jewish holy elements to a particular site. Oliphant was right, but he had no idea why. Despite Dray’s skepticism, it didn’t take long for him and Ben-David to realize that they had come across the nearly complete remains of a mid-5th century synagogue; a pivotal era that saw the height of Christianity across the Levant and the peak of Talmudic scholarship among the Jews. Both ended with the catastrophic earthquake of 749 and the fall of Umayyad rule. “It only took two weeks,” says Dray, “but after we found six different menorah engravings, the engraving of the four species on the columns of the altar, and a fully-intact Torah ark, we could confidently say that we had found a synagogue.” Dray is referring to engravings of the Jewish candelabra and the four plants associated with Sukkot, the Jewish Festival of Tabernacles. The reconstruction project of Umm el Kanatir, which finally got off the ground in 2003 after a lengthy period of bureaucratic impediment, revealed a number of other noteworthy finds that advanced the overall understanding of the day-to-day existence of the villagers and the problems they encountered while living as a minority population in a regional backwater. Most telling was the discovery of over 10,000 coins, as well as metal bars used to secure the synagogue’s windows. The massive cache of coins points to a uniquely wealthy community, while the metal bars suggest a constant danger from marauders and religious fanatics unhappy with the success of a local minority ascribing to different spiritual beliefs. In order to understand where the wealth of the community originated, all one has to do is to walk 200 meters south to the local spring. Next to the spring lies a series of limestone and chalk basins. These types of sedimentary rock are an anomaly on the basalt steppes where Umm al Kanatir is located and could only have been brought there from the southeast. The villagers must have had a strong economic incentive to undertake such a project and which could only have been connected to the local textile industry. The sages of the Talmud make multiple references to the importance of pure flax-linen, especially in regard to the burial of the dead. It was considered extremely important to honor the deceased by wrapping their bodies in finely woven vestments. Furthermore, the nearby city of Beit Shean and provincial town of Arbel are mentioned as the primary regional manufacturers of the fabric. It is no surprise, then, that the man-made basins near Umm al Kanatir still contain traces of flax. Adding a water-based mixture to chalk provides the main component for dyeing fabric. The role of dyed-white linen within Jewish ceremonial practice is well known; but it was also sold as a standard textile to non-Jewish neighboring communities. “All [the villagers] would do is buy the flax, chemically engineer it into a marketable material and resell it at a much higher price. It’s that simple. 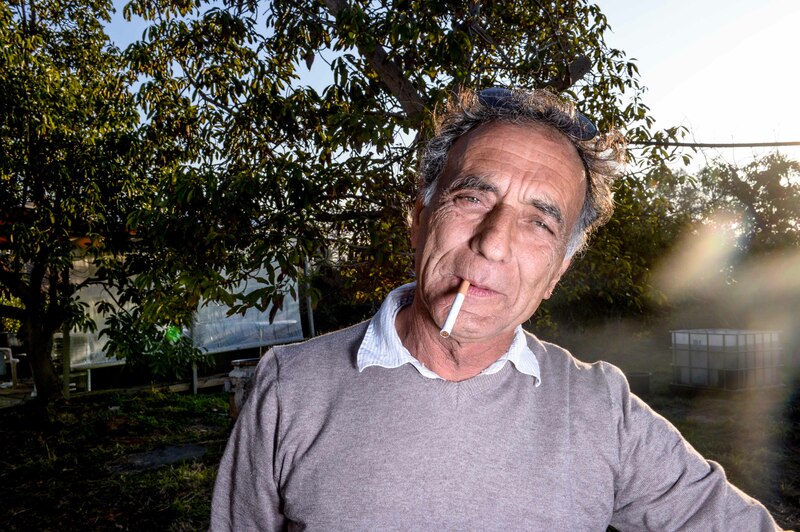 What do you expect from a small Jewish community on the fringes of a highly volatile society where it may have not been welcome?” Dray says, chuckling. Whether or not the synagogue was built in 80 years or three is of less importance to Dray. Instead, he wants people to understand that archeology, like all other sciences, must be taken with a grain of salt. “Again, I am not here to theorize and make proclamations. I just look at what I find and the facts, that’s all. The rest, I will leave to the experts,” he says with a grin on his face. While he slowly enjoys his second cup of coffee, another one of Dray’s friends enters the scene tossing a clementine in the air, and the two exchange hugs. At the sight of the citrus treat, one of the donkeys roaming the farm wanders over to the covered area. Without peeling the fruit, Dray feeds it the clementine and juice sprays everywhere. It will be some time before Dray spends the weekend here again, taking in the subtle winter breeze as different friends stop by to catch up and enjoy a quiet Saturday with clementine-eating donkeys. At the end of the month, he is heading to Australia for the better part of a year. Upon his return however, it is still unclear as to whether or not Dray’s work at Umm el Kanatir will continue. While his work at the site was originally slated to be completed next year, Dray thinks he’ll be waiting a while to finish the restoration. “Everything you read about the project being completed by 2015 is an embarrassment,” he says with a slightly contemptuous yet wry smile. 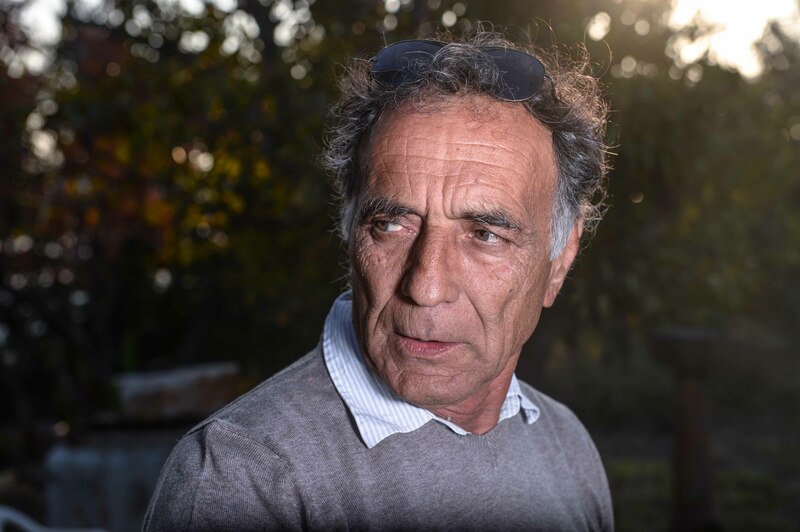 He explains that a misuse of funding from the Prime Minister’s Office and bureaucratic conflict with the local regional council has slowed the work to a crawl. It’s all in place. The machinery needed to complete the reconstruction is at the site, but we will not be able to add the second floor. Unfortunately, the money was used to build a massive parking lot and visitor’s center—both of which have no necessity if we cannot complete the project. Instead of investing the money to finish this unique restoration, the Prime Minister’s Office decided to build two unnecessary structures whose only use so far has been to destroy critically important environmental aspects of the area. This was the only part of the interview Dray wanted to be fully recorded, and it is absolutely essential to him that this aspect is understood. “Now that is something you must put in writing,” he says, emphasizing each word as he gets up to stretch his legs and light another cigarette. In the 12th century, the famous chronicler and patriarch of the Syriac Church, Michael the Syrian, described in lengthy detail the colossal earthquake that struck centuries prior and destroyed everything from the smallest villages to the largest metropolises. He specifically mentions the city of Tiberias and thirty synagogues in the region around it. Not a single one of those synagogues was rebuilt, and it appears that the already provincial Jewish communities of Jund al Urdunn either perished in the quake or left in pursuit of greener pastures across the Levant. Today, visitors exploring the ruins of Umm el Kanatir will see the beginnings of a meticulously organized restoration project that will give new life to an area lost in a moment of sudden tragedy. The first level of the synagogue at Umm el Kanatir is standing as it did until January 18, 749; and a glance inside affords an impressive view of the altar and its ark angled in the direction of Jerusalem, as well as benched seating around the synagogue’s inner perimeter. The eternal memory of the menorah, whisked away by the Roman soldiers who destroyed the Temple, has remained in the collective memory of the Jewish people throughout history; so it is no coincidence that it is engraved on both the inner structure and outer facade. The one on the northeast corner of the exterior would have been visible to travelers arriving via Wadi Samakh 1600 years ago, and is still eye-catchingly distinguishable today. 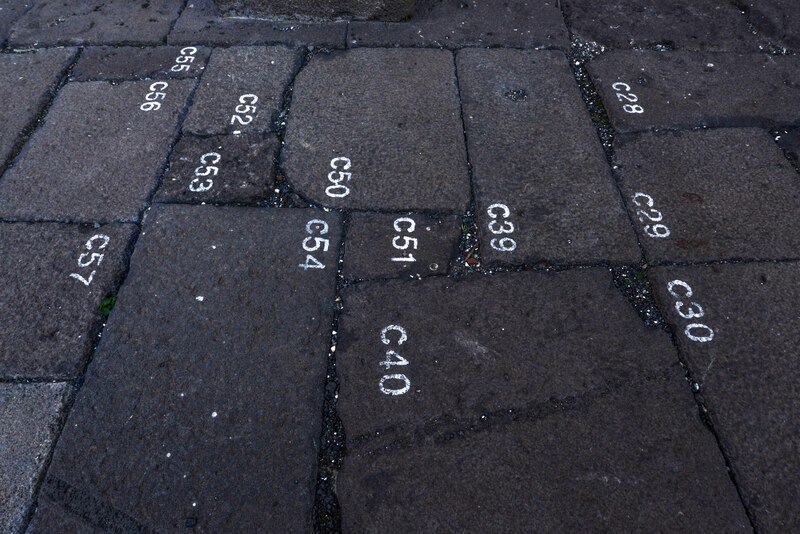 Nonetheless, the mounds of basalt stone blocks—the synagogue’s second level and gabled roof—will have to remain as they are until a solution is found to the bureaucratic and financial problems surrounding the site. Instead of an authentic and sacred look into the past, an imposing yellow crane dominates the site’s natural beauty. 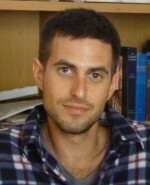 In Israel, new archeological discoveries that strengthen the historical Jewish connection to the land are often used as vehicles of political empowerment; intended to counter those who attempt to delegitimize the state by negating the relationship between the Jewish people, their faith, and their historical roots in ancient Israel. This makes the case of Umm el Kanatir even more puzzling, since completing the reconstruction project as quickly as possible would provide the largest single collection of evidence testifying to the vibrancy of Jewish life in the Land of Israel in late antiquity. 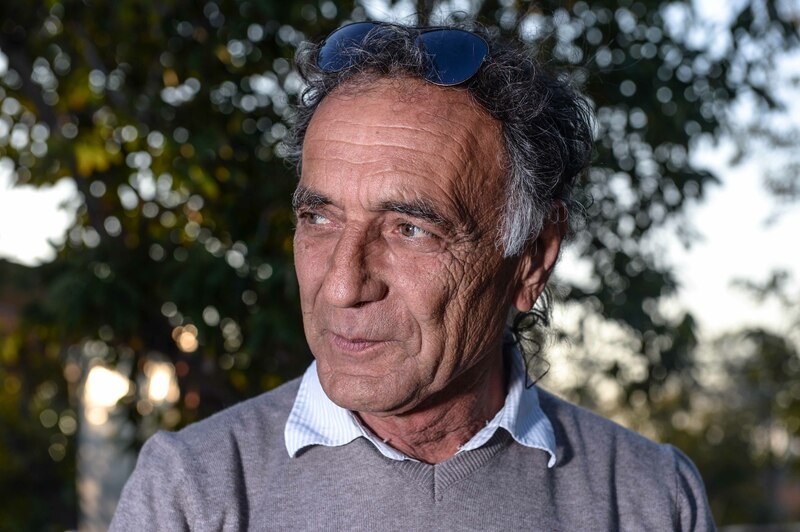 For Yeshu Dray, his work on the restoration of ancient technologies will continue upon his return from Australia, even if Umm el Kanatir remains at a standstill. But for the bygone villagers whose communal strength was magnified through their synagogue, their story will remain in limbo, half in the present and half in the past. As the sun set over the Arbel cliffs to the west, the clouds of dust and plumes of smoke steadily concentrated over the lake, but any clear visibility beyond the valley remained in the eyes of the befallen The dyeing basins of Kantur were inundated with rubble and soot, but it didn’t matter because the survivors had no intention of ever using them again. All that could be done was to take the scattered remains of the dead, wrap them respectfully in the soft linen burial garments, and inter them with a blessing for the deceased. As the survivors gathered their minimal belongings, strewn throughout the destruction, the next morning’s rising sun would symbolize the beginning of their unpredictable and forsaken future, while their past would exist only as a blurred kaleidoscope of memories.